We have 3 July birthdays in karate, and they’re all within 10 days. That means 3 different birthday treats. Yikes!! The middle birthday is mine, and this year I got ice cream treats and flowers. Ice cream after karate? Fantastic!! 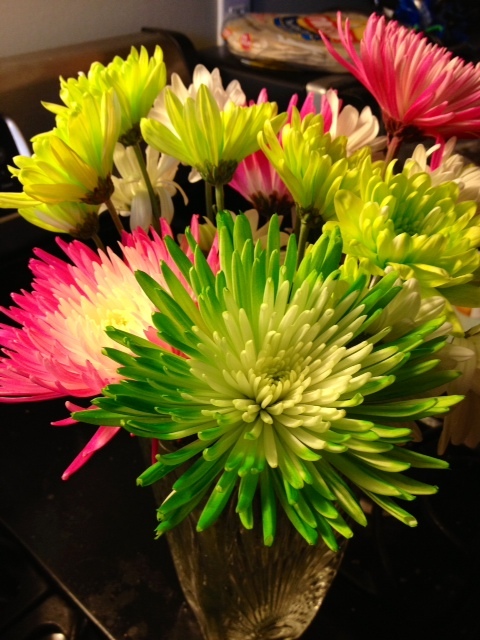 And I’m still enjoying the flowers! I made desserts for the other two birthdays: strawberry cheesecake for Alex, and these Oreo Fluff Brownies for John. 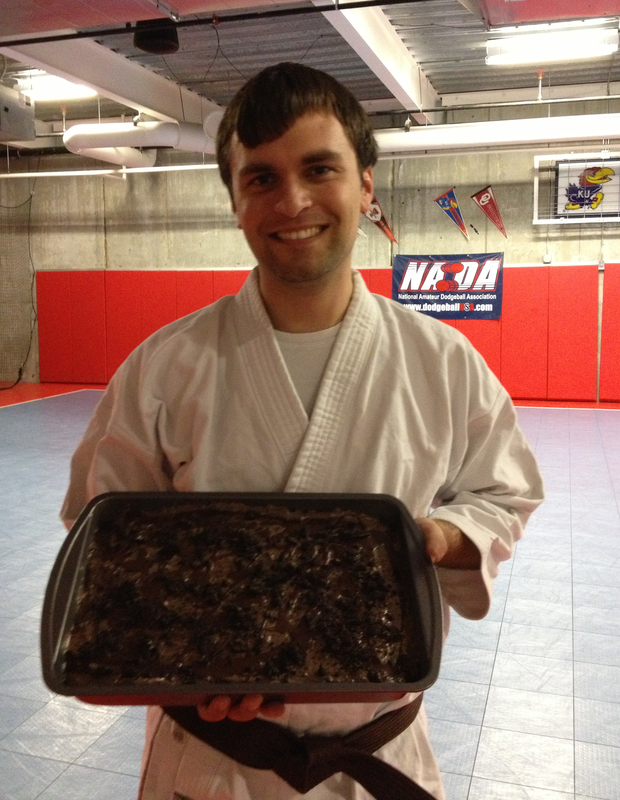 John loves brownies, and last week he was saying how much he loves Oreos. 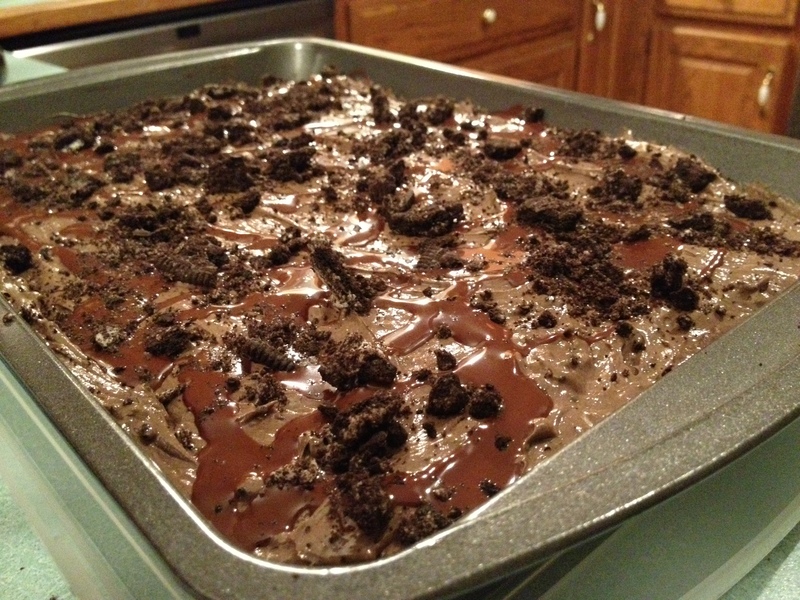 So after a little poking around on the internet and looking at various ideas, I settled on the idea of Oreo Brownies. I found a recipe for Oreo Truffle Brownies, which is the delicious combination of Oreos and cream cheese atop a brownie base, and thought those sounded good. But I was really sugared-out from Birthday Week and all the treats I was given for my birthday, and it just sounded too rich and too chocolatey – if you can believe that! I was thinking about how to lighten them up a bit and decided to use one of my favorite frosting additions – marshmallow fluff. It’s something I use to “customize” a can of pre-made frosting, or to combine with a block of cream cheese to make a lighter cream cheese frosting. It adds a little “something” that can really make a difference! I used a boxed brownie mix because I was having a challenging week at work and made the “cake” version. If you want to make brownies from scratch, try the Craggy-Topped Fudge Brownies on the Mix it Up! page. After they cooled, I mixed up the topping, smeared it over the brownies, drizzled on some quick-setting chocolate ice cream topping, and popped them in the frig to set up. I think the marshmallow addition was just right! It kept the topping from setting too hard, and provided a lightness that was really nice. The birthday boy was happy, too! 1 9×13” pan of brownies, baked according to directions and cooled. Beat the softened cream cheese in a mixer until smooth. Set aside ½ cup crushed Oreos and add the rest to the cream cheese and mix well. Now stir in marshmallow fluff and mix until there are no streaks. Spread the Oreo mixture on the brownies. Drizzle with the Magic Shell chocolate topping and quickly sprinkle the remaining Oreo crumbs on top. Place in frig to let the topping set up. Store in frig. The topping will still be somewhat soft, but it will set up some.